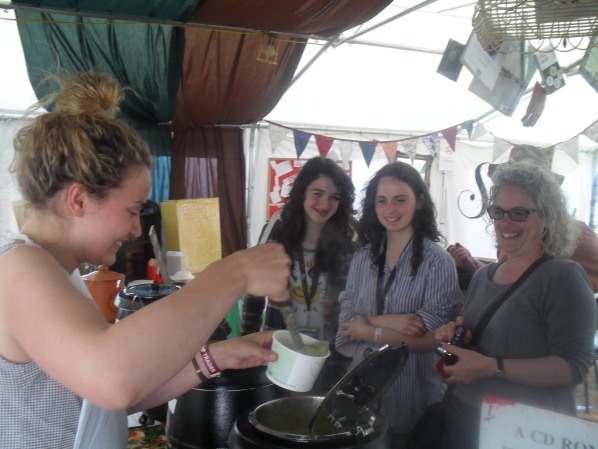 Healthy food and a good book is proving to be a recipe for success for Bristol University student Millie Forrest, whose novel catering experience is taking the festival circuit by storm. The Soup Library gives revellers a chance to escape from the melee and enjoy wholesome soup in a library setting, complete with books and friendly librarians. Millie, a final year Sociology student, launched her brainchild in autumn 2010 and has since fuelled people at a number of festivals. This summer looks set to be even busier, with bookings for Wychwood, The Secret Garden Party, WOMAD and Wilderness festivals. Festival-goers eat communally at two long trestle tables, with a variety of quirky books, instruction manuals and magazines for people to peruse while they enjoy homemade, vegan and vegetarian soups, all served by a team of librarians, who have comedy name badges such as ‘Miso Soupy’ and ‘Soup-er Freak’. The fun festival atmosphere carries on inside the tent, with the librarians doing readings and library quizzes, notice boards for people to leave messages, and even bedtime stories before people stagger back to their tents. She came up with the idea after working at festivals and experiencing a lack of different and quirky food options. Despite having to juggle her dissertation with soup making, Millie says it’s been a good learning curve and hopes to bring the unique vibe of The Soup Library to more events in the future. Millie is also looking for investment in The Soup Kitchen, and is keen to raise £200 to help her to buy new equipment. All of those who pledge money via the fantastic Sponsorcraft website will also get rewards, levels of which are dependent on the amount pledged. Click here to find out more details and to show your support!